I was recently interviewed on the Newbie Writers podcast with hosts Damien Boath and Catharine Bramkamp. I had a fun time discussing various aspects about writing historical fantasy as well as the challenges of writing a sequel. Catharine asked me about the urge to want to include information found during the research process, basically to incorporate what I learned into the narrative. I understood the urge, but told her that I resisted that temptation. Especially when I thought it might be confusing to the readers or yank them right out of the narrative. As an example, I mentioned a bit of trivia that I came across several years ago regarding Medieval religious dietary restrictions on fast days when meat and other animal products from were not to be consumed. I mentioned the book Fast and Feast: Food in Medieval Society by Bridget Ann Henisch as the source of this information about Medieval fast days. It is a wonderful book and I recommend it for those interested in learning more about Medieval diets and religious customs. There were periods such as Lent and Advent when fast days lasted for weeks, but there were also fast days every week: Wednesdays, Fridays and Saturdays. To clarify, these fasts was not when no food was consumed, but rather that there was a deprivation of what could be eaten. The foods to abstain consisted of meats and poultry as well as other animal products such as milk, butter, cheeses, and eggs. That did not mean that people became vegetarians during this time, but instead they were allowed to eat fish because it was from the sea. Here's a quote from Henisch explaining the theological reasoning why fish was allowed to be eaten on fast days. Fish, providentially, had escaped God's curse on the earth by living in the water. Water itself was an element of special sanctity, washing away the sins of the world in Noah's Flood, and the sins of the individual in baptism. Its creatures might be said to share something of its virtues. Once the choice had been justified, the rest was easy. - page 33. The part that I found so memorable about her discussion about what foods could and could not be consumed in Medieval times on fast days was the inclusion of beavers as food from the sea. 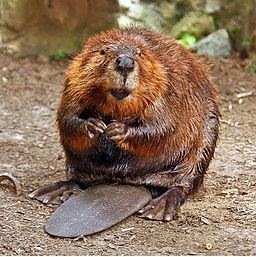 Yes, I didn't have my own picture of a beaver, so I found one from the Wikimedia Commons. Enjoy. I knew when I read that people could eat beavers on fast days that it was something I could not bring up in my novel. My readers would be pulled right out of the narrative by laughter at the mere thought of eating a beaver. Damien was especially amused at the inclusion of beaver meat in our chat. He inspired me to re-read the passage by Henisch describing the reasoning behind the acceptance of beavers on the Fast days menu. I believe that if I used either term "beaver tail" or "beaver meat" in a novel that it would cause my readers to laugh out loud and in an inappropriate manner. That is why I chose not to include any mention of the consumption of any portion of the beaver, but it sure makes for an amusing anecdote. Damien was so taken with the discussion of beavers that he entitled my episode "The Mythology of Beavers." or can be listened to on YouTube where it was streamed live and has the title "Greek Mythology and Fantasy with Linda McCabe." Heck, if I knew he was going to give it a title regarding Greek mythology I would have talked more about that subject than just mentioning Athena and Hector of Troy in passing. Oh, well. It was a fun chat and I hope others might enjoy hearing the interview and my insights. This Tuesday, January 28, 2014 is the 1200th anniversary of Charlemagne's death. So to help celebrate that I am ending this post with a picture I took during my trip to Germany in 2011. 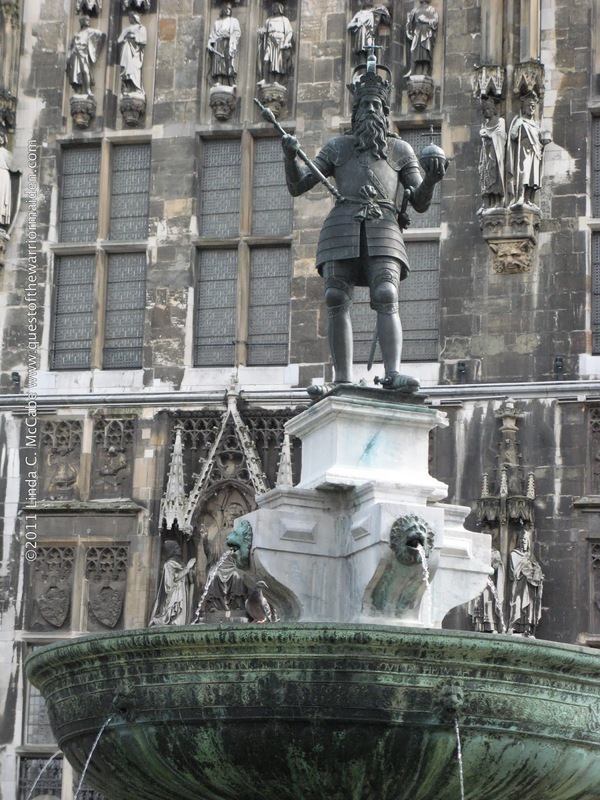 This is a statue of Charlemagne outside the town hall of Aachen (the Rathaus) that was built where his palace once stood. Twelve hundred years ago. That's a huge anniversary and this year there will be many celebrations in Aachen to mark the landmark anniversary. For those who might be interested in traveling to Aachen, here is a link to some of their plans for the year. Please feel free to leave an example of weird Medieval trivia you may have come across over the years.